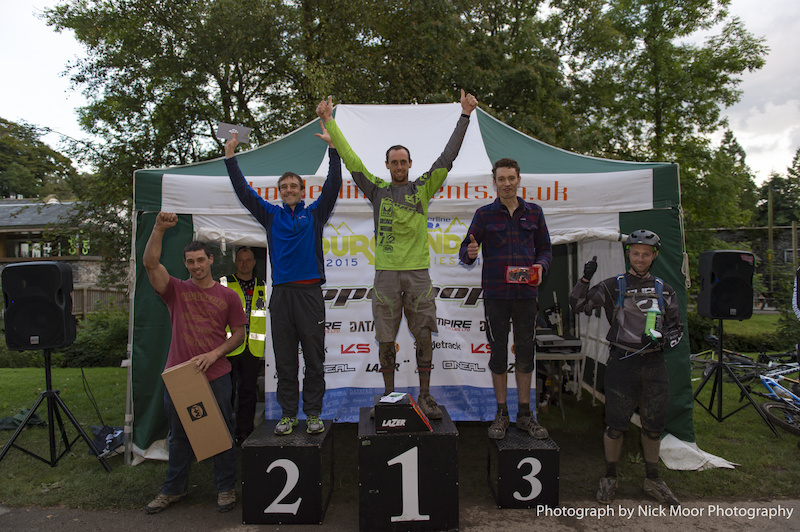 The biggest and toughest round yet of the PMBA enduro series took place last weekend at Grizedale forest. 5 stages, 15 miles, 3000ft were the stats on the lap, ridden twice with morning practice and the race in the afternoon. Dave Read tells us about his day that saw him as the eventual winner of the Masters cat, and the series win with a 67 point lead going into the final with only 60 points up for grabs. 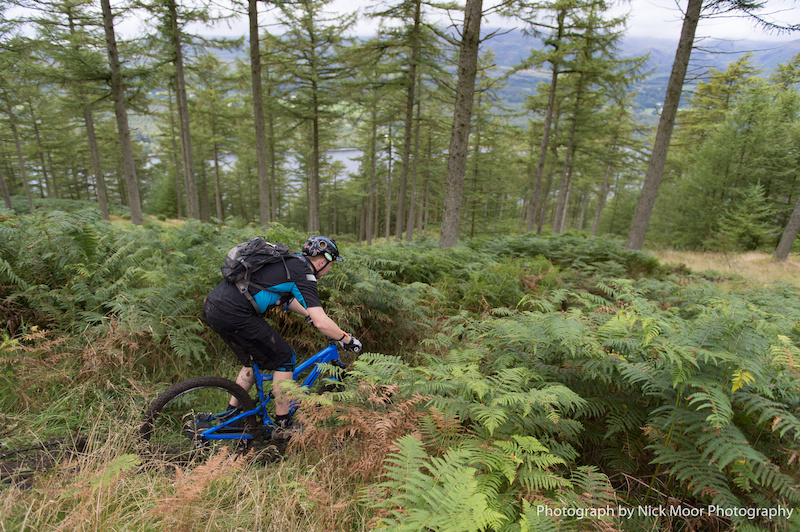 Round 5 of the PMBA enduro series sees us visiting Grizedale in the Lake District. Although it had steadily tipped it down for the majority of the night we woke up to a clearing sky and headed to the main car park to meet up with the rest of our mates. 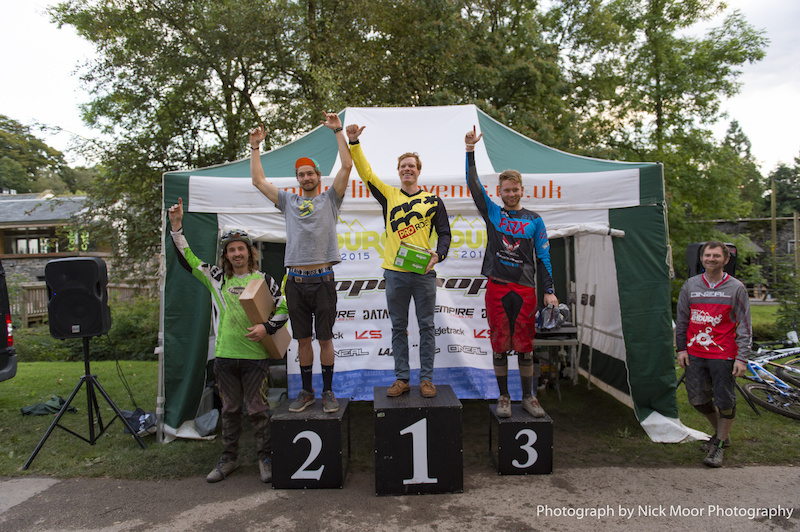 With nearly 340 racers the place was booming! With the sun now shining it was time to head out on our race lap, the PMBA races are super laid back, you can ride the loop with your mates and seed yourselves accordingly at the start of each stage. Set off in groups of ten every five minutes to try and avoid queueing we head out on the epic transition to stage 1. Stage one starts in a clearing deep inside the forest then drops into the trees and off a small drop, this then leads into a super off camber rooty right hander. Carry on down through the tight trees you’re faced with multiple line choices as the track comes out into the open, a few fast corners and down a steep muddy shoot. Next up a flat but technical sprint up a couple of rock steps before dropping down through a small rock garden and into a fast catch berm, out the berm off a jump two more bermed corners then a sprint into probably the most technical part of the track. A small step up and then step down off camber and littered in muddy roots and wet slippery rock, get this wrong and it’s gonna hurt! Stage two is the longest of all the stages and for me the most fun, after catching a rider on stage one I position myself behind a couple of mates for the best chance of a clean run. 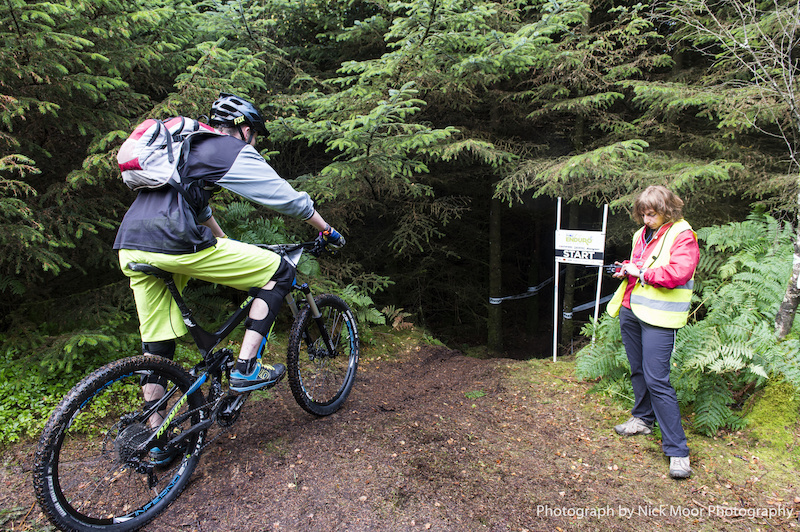 This stage was originally dug by the guys that run the UKGE and offers a great mix of terrain with tight tech, open loam, a fire road climb and balls out descents! The stage starts tight in the trees with mud rocks and roots to catch you out, a couple of tight corners and a steep muddy shoot littered in tree stumps and roots. This opened out into a slight clearing with mud being the main course, over the brow and into an off camber traverses stay high before slapping 3 epic deep rut berms, Hero berms! Out onto the first fire road for a super-fast long right hander then hook to flat on the generously taped middle section. More Rooty corners and a traverse across a fern covered hillside with mature pine trees, this section had changed quite a lot since practice with several new lines showing. Hard to pedal on this section so you had to maintain your speed and work the trail to get the best out of it. Now drop onto the next fire road for a short uphill sprint, this was also part of the transition up to stage 3 so there were plenty of people there to heckle and offer great words of advice like PEDAL!!!!!!! (Thanks Bex Baraona) Off the fire road and down a steep rock filled descent, if your bum wasn’t wet before it was now! Across a footpath and the trail gets faster and faster, as few sneaky Brian Harrison straight lines you fire off a log step down, slight left across some roots at warp speed then left into a difficult right hander dig deep for a quick sprint and across the line! Stage 3 off the top of Carron Crag the highest point in Grizedale forest, this would be make or break for many people. The stage is DO or DIE, well DO or smash your mech off and get a puncher! The stage starts with a tight single track decent, I tend to hop to the edge of the track that is much smoother and faster. You then drop down a small off camber slab and into the trees, a quick sprint then down through the Data Tag chicane and back out into the open. From here it is a case of who has the biggest minerals; it really is how fast do you dare go? Fast, wide, wet and rocky the trail goes left and right and drop down every increasing rocky drops. Two wheel drifting to the outside of the corners there are people lining the trail repairing punchers. So many sniper rocks you have to be on your line or your gonna come a cropper. I sprint hard down to the finish but out brake myself and stoppy across the fire road at the bottom and into the brush on the other side before gracefully dismounting! No I didn’t I went over the bars unable to unclip and ended up face down with my bike onto of me fumbling around much to everyone’s amusement! What a stage though, Hold it wide and let it slide! Stage 5 was only short but sweet, quick sprint down the fire road then into the trees turning back on yourself, fresh cut trail then into the rock slab of doom. I had practiced this about 5 times and had crashed every time. Crashed on the way into it, crashed my way down it, and crashed out the other side. One time I even felled a small tree using my testicals! Any how I arrive at the slab of doom in my race run and low and behold a crash awaited me, thankfully just a small off with genitalia intact. Now a lung and leg burning sprint all the way back to Grizedale bikes for the end of the stage. Racing over and the arena if alive with excited people and tales of glory and smashed dreams, I high five my mates and head off to the timing tent to hand in my dibber. The timing is super-efficient hand in your timing dibber and you instantly get your stage results and overall time printed out on a receipt sized piece of paper. The results then update on a large TV screen as riders arrive back, no waiting around instant bragging rights amongst your mates. When the last rider is back the results are checked and the podiums are on. Also thanks to all my mates at these events, you make the events so much fun and laidback. Finally thanks to Mike, Kev Duncan and everyone else who puts the events together, and most importantly the marshals who without we would not be able to race. Thank you.